Registration of medical devices including preparation of a dossier (application), importpermit, technical and toxicological tests, clinical trials etc. Renewal of registration certificate. Please see more details here. Market research, Distributor search, Market entry: sales activity, company representation, contracts managing, logistics and customs. Company registration, Legal support, HR consulting, Translating, Notary, Apostille. We provide our services in all regions of Russian Federation. MEDSERVICE company is a reliable partner for the registration of medical devices in Russia. We apply in practice the knowledge and experience obtained during more than ten years practice in the registration of medical devices. The company's specialists will advise you in Russian, English on obtaining registration certificates of Roszdravnadzor. Medical devices in Russia are classified in Class 1, 2a, 2b and 3. 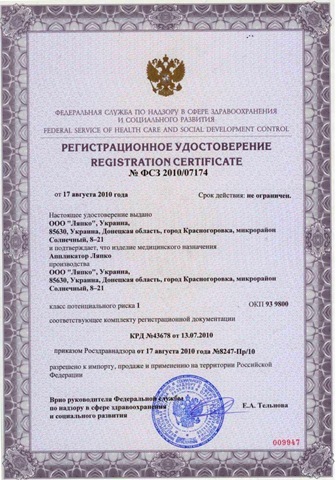 Our company MEDSERVICE can help you with medical device registration in Russia. Trying to navigate the Russian bureaucracy and language without the assistance of an experienced local representative generally leads to frustration. Representatives at Roszdravnadzor prefer to do business in person (in Russian) and generally will not provide consultation by phone. MEDSERVICE has an office in Moscow and we can assist you with all aspects of medical device registration. With help from MEDSERVICE, medical device registration can often be achieved in 12 to 16 weeks, depending on product classification and identification of predicate devices. Determine classification of family grouping of your devices in the Russian Federation. Coordinate with Roszdravnadzor on indentifying required product testing and coordinating shipment of product samples to accredited testing labs within Russia. Prepare registration file according to Russian regulations. Facilitate all Testing (Technical, Toxicology, Electrical, Medical) necessary for registration of your device. Coordination of application submission to Roszdravnadzor within the Ministry of Health. Coordinate of testing, application and registration fees. The overall registration process for medical equipment usually takes between 4 and 6 months. Actual costs of registration need to be determined on a case-by-case basis. Registration of medical devices: technical and toxicological tests, import permit, clinical test etc.